I just found this article while scrolling through my Facebook news feed: The Universe is Slowly Dying. Well, this doesn’t surprise me. For all of you who are too busy (or lazy–let’s be honest) to read the full article from CNN, it basically says that the universe is slowly fizzling out. It has lost half of its energy, and that will continue to decline for probably trillions of years until we reach the end. Why is this important right now? Better yet, what does this have to do with God? Now I saw a new heaven and a new earth, for the first heaven and the first earth had passed away. Also there was no more sea (Revelation 21:1 NKJV). And He said to me, “It is done! I am the Alpha and the Omega, the Beginning and the End (Revelation 21:6). 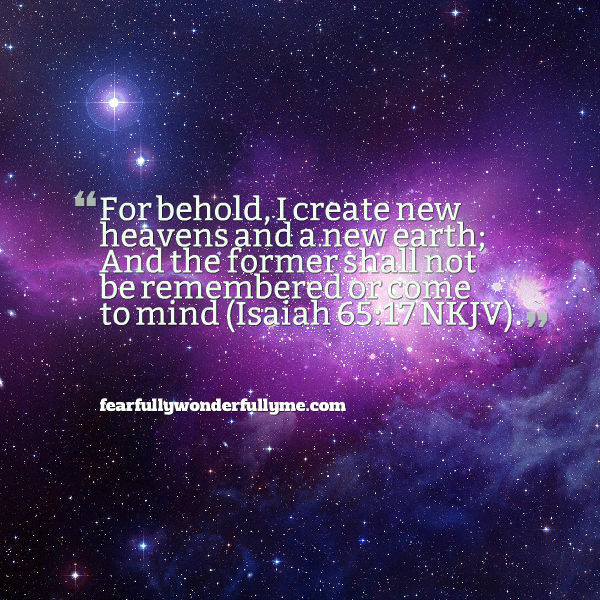 For behold, I create new heavens and a new earth; And the former shall not be remembered or come to mind (Isaiah 65:17). This is good news! Jesus is coming, so we need to start telling people. I just wonder what the new universe will look like. I’m assuming it will be even more gorgeous than the one the Lord has given us right now. I believe the universe will not wear down to the point where it no longer “declares the glory of God.” The universe, both spiritual and physical, is anxiously anticipating its transformation at the 2nd Coming of Christ. All creation groans under its present frustrating burden of decay and dissolution (Rom 8). But as she awaits her Maker’s Return, she exults in displaying the beauty that still resides in her awesomely bestowed design. Those wayward human souls who truly hear her cry of praise to her Creator have the chance to hear His call in her song and change their minds and hearts. This is a poem I wrote about this attractive broadcast God uses in nature…. There’s beauty in a panoramic view of land and sea. There’s dancing in the heart that hears a birdsong’s melody. Amazing grace and glory in our naked human form. God’s miracles abounding all around us, all our days. Our God who stands behind them waits for us with open arms. Enthrallment and enjoyment were intended by His hand. That’s found alone in union with our Maker’s loving heart. Beautiful! We can only imagine the beauty that is to come.